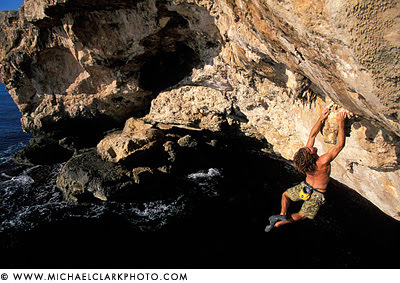 Michael was just recently awarded the overall grand prize "Best in Show" in the Teva Mountain Games Zest for Adventure Photography Competition for his image of Chris Sharma deep water soloing on Big Momma (5.13d/14a) in Mallorca, Spain (see image above). The image also won "Best in Category" for the Ice & Rock section of the competition as well. With close to 400 images submitted it is a great honor to have my image chosen as the "Best in Show". The image of Chris Sharma - who was also awarded an Everest Award for "Male Climber of the Year" - will appear in Outside Magazine this summer and it was also on display at the Teva Mountain Games in Vail, Colorado. Congratulations. I have always liked that photo of yours.